Echo Dot Flush Ceiling/Wall Mount with Optional Receptacle Outlet Location! Echo Dot Flush Mount with Optional 110 v receptacle outlet location. This mount can be installed in the wall or ceiling. With optional receptacle just plug in your Echo Transformer and your good to go Via Bluetooth. 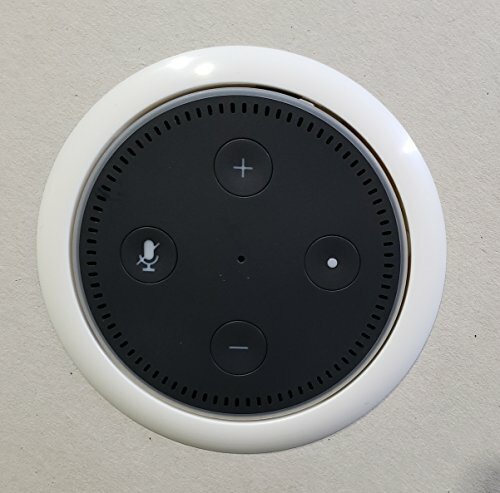 Echo Dot and receptacle are not included with mount. This mount will fit in standard 2x4 wall with 1/2 sheet rock or less. Optional outlet to be used is the: Sillites Self Contained Receptacle for sale on Amazon. Installation video can be found on You Tube under the Evolving Prototypes Page. The current housing is made with the injection molding process, the same process as conventional electrical boxes.